You may have noticed in the bottom left hand side of all of our web pages there is an ATOL logo – like the one to the right. ATOL 3253 is Honeyguide's unique ATOL number and this shows that all monies paid by you for our air holiday packages are ATOL-protected. The ATOL system is run by the Civil Aviation Authority. This web page is to explain a little more about this and developments in consumer protection linked to ATOLs. Please see our booking conditions for further information. The recent additions to these, standard wording from the CAA, you can read by clicking on the red writing to read our ATOL Terms and Conditions. These are now integrated into the booking details in the Honeyguide brochure, and on the PDF booking form/conditions on our booking page). For more information about financial protection and the ATOL Certificate go to: www.atol.org.uk/ATOLCertificate. Every tour operator offering 'packages' – that is holidays that include more than one element, such as flights, accommodation and local transport – has to provide the buyer with protection. The framework for this is the EU's Package Travel Directive and UK regulations that flow from that. When it's a flight-inclusive package – as all Honeyguide holidays presently are – then tour operators must hold an Air Travel Organiser's Licence. It ensures that in the event of a tour operator becoming insolvent, consumers already abroad can complete their holidays and be returned to the UK and those who have paid for their holidays but have not yet departed will receive a full refund. Honeyguide has held an ATOL for 26 years. It's what the CAA calls a 'Small Business ATOL' (SBA), for tour operators running fewer than 500 holidays a year. 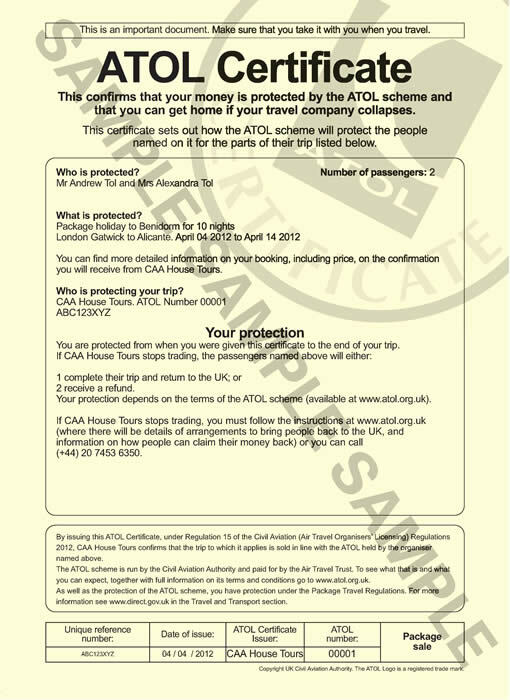 The new style ATOL Certificate, issued since October 2012, looks like this (right). Honeyguide presently prints these in black and white. More information on the ATOL pack peace of mind campaign on the right. ATOL Protection Contributions (APCs) were introduced in April 2008 to raise funds for the Air Travel Trust Fund (ATTF), which meets the insolvency protection costs of the ATOL scheme. The failure of XL leisure group in September 2008 and the effects of the recession have caused serious financial challenges for the ATTF. Following a consultation by the CAA in early 2009, the APC paid by travel companies to the ATTF rose from £1 to £2.50 per passenger. This sum is included within the price of your Honeyguide holiday. Comment: on the one hand, it is irritating that travellers with generally sound small operators are caught by a problem created by the collapse of one large business. On the other hand, it remains a relatively small sum per person to support the robust and valuable ATOL scheme. When it came in, the travel press quoted various leading lights from big operators in the travel industry suggesting this change will bring travel its knees. These claims can be taken with a pinch of salt. (2) buy their own flights, nowadays easy to do on the internet and sometimes a practical response when travel arrangements are complex. At the moment, any travellers for whom Honeyguide does not buy a flight is not covered by Honeyguide's ATOL. "... for modernising the Civil Aviation Authority’s regulatory framework." (Full details here.) Much of this is to clarify and improve the scope of the ATOL system, especially in the light of some failures of big travel companies and to respond to how people buy holiday components on the internet. They propose that non-air holidays can be covered by an ATOL in future - see right for the full text. "... support the proposal to extend the scope of ATOLs to non-air packages. This is for the reasons set out in paragraph 13.75, namely to offer protection to consumers but to keep costs low and bureaucracy simple by being able to include a small number of non-air package holidays within the ATOL." "The proposal to extend the scope of ATOL to non-flight packages has not been included in the current consultation. This proposal received some support during the 2009 Regulating Air Transport consultation, and we have certainly not ruled out including this measure in the medium to longer term reforms of the ATOL scheme." First published January 2010, last updated December 2014. You can see Honeyguide's Air Travel Organiser's Licence 2019-20 here (Honeyguide's 26th renewal). 'Rebalancing ATOL': this was the name of proposals by the CAA to make changes to the ATOL system, to reduce the impact of companies going bust. Initially doing away with the Small Business ATOL (SBA) was proposed, but in response to a raft of comments about the problems this would bring for SBA holders (Honeyguide's comments here), the CAA decided (March 2015) to keep the SBA. Tougher criteria for new SBAs will be introduced, and a qualification for accountants verifying ATOL returns. All ATOL holders have an 'Accountable Person' and he or she must complete an online training course on the role by February 2015. Honeyguide's accountable person is Chris Durdin, who completed the course in December 2014. View the CAA certificate here. Updated ATOL wording and terms & conditions, see 'Your ATOL protection', left. The CAA's website promoting ATOLs www.packpeaceofmind.co.uk launched December 2012. Download the 'Pack Peace of Mind leaflet here. The latest phase of the campaign (January 2015) has new graphics of 'Justine Case and family' (below) and is due to be repeated in early 2016. It "... is targeting families who may be more price driven and more likely to book with unprotected travel companies. 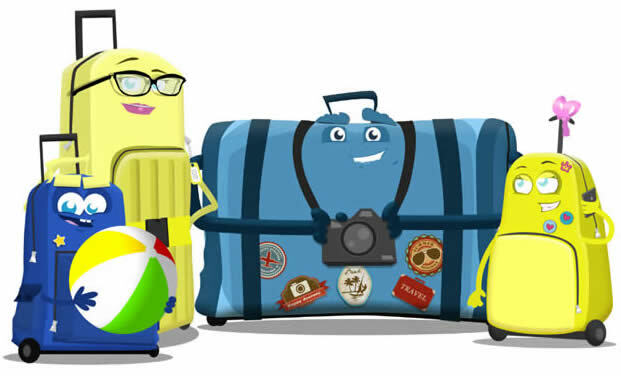 We are therefore encouraging families to look beyond the price and make sure their holiday is ATOL protected." When you buy an ATOL protected air holiday package from Honeyguide Wildlife Holidays you will receive an ATOL Certificate from us confirming your arrangements and your protection under our Air Travel Organiser’s Licence number 3253. In the unlikely event of our insolvency, the CAA will ensure that you are not stranded abroad and will arrange to refund any money you have paid to us for an advance booking. For further information visit the ATOL website at www.atol.org.uk or www.packpeaceofmind.co.uk. ATOL Protection does not apply to holiday and travel services when a flight is not included. Please ask us to confirm what protection may apply to your booking. Extract from the Department for Transport's proposals to widen the scope of the ATOL system. "13.75 Many companies sell both air and non-air holidays and would prefer to protect them all through the CAA to reduce costs and bureaucracy. It is proposed as a Better Regulation measure that these companies are given the option of protecting all their packages, both air and non-air with the CAA by contributing financially to the Air Travel Trust, the body that manages the funds collected to meet the costs of ATOL protection. This arrangement would be available to companies whose main business is selling air based package holidays under the ATOL scheme, but who also sell a small amount of non-air package holidays. These companies are likely to face the greatest burden of having to protect their products under two sets of arrangements." CAA staff kindly checked this web page when it was in draft, and were happy with its contents. The ATOL Licensing team also reviewed changes made in February 2014 and confirmed they were correct. Those changes were to use the CAA's current recommended wording about ATOL protection.